Heritage Paint and Decorating Centers serves the Houston, Texas and surrounding areas as the leader in Benjamin Moore Paints. Whether you are a Paint Contractor or a "Do-It-Yourselfer", Heritage Paint can provide you the necessary paint products, faux finishing products, concrete stains, acids and sealers, as well as the painting tools and brushes you may require to successfully complete your project. 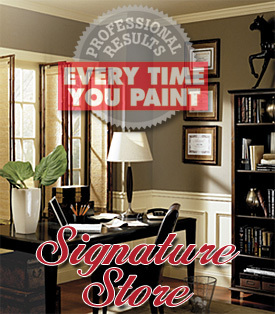 Special orders are no problem for Heritage Paint and Decorating Centers. Let us know if you have a favorite product, and we will do what we can to stock or special order it for you. Be sure to take advantage of our special features links at the bottom of the web site. Free weekly tips, color hints, paint color viewer, paint color samples and ideas. Also, you may access all Benjamin Moore MSDS and Technical Data Sheets at the bottom of each page on the Heritage Paint and Decorating Centers' Web Site. Paint, Heritage Paint and Decoration Centers, Benjamin Moore, Houston, Texas, Paint Company, Retail paint store, Paint brushes, tools, sealers, primers, enamel, latex, concrete stains, acid, Benjamin Moore, AdiColor, Bella Vernici, Modern Masters, Daich Coatings, Skimstone, Chem-Coat. Heritage Paint and Decorating Centers has been serving the Houston, Texas and surrounding areas as the leader in Benjamin Moore Paints. Heritage Paint is a dealer for Benjamin Moore, AdiColor, Bella Vernici, Modern Masters, Daich Coatings, Skimstone and Chem-Coat. Heritage Paint in Houston carries all the additional painting tools and supplies you may require.